Last year, we covered beautiful Charleston, a city full of Southern charm, cobblestone streets, beaches, and so much good food. That's when met the amazing ladies of The Makers Collective, the Greenville-based organization that works with Southern creatives to help them gain exposure while cultivating a community of support. We partnered with them again this year to bring you the top gifts from the Palmetto State. 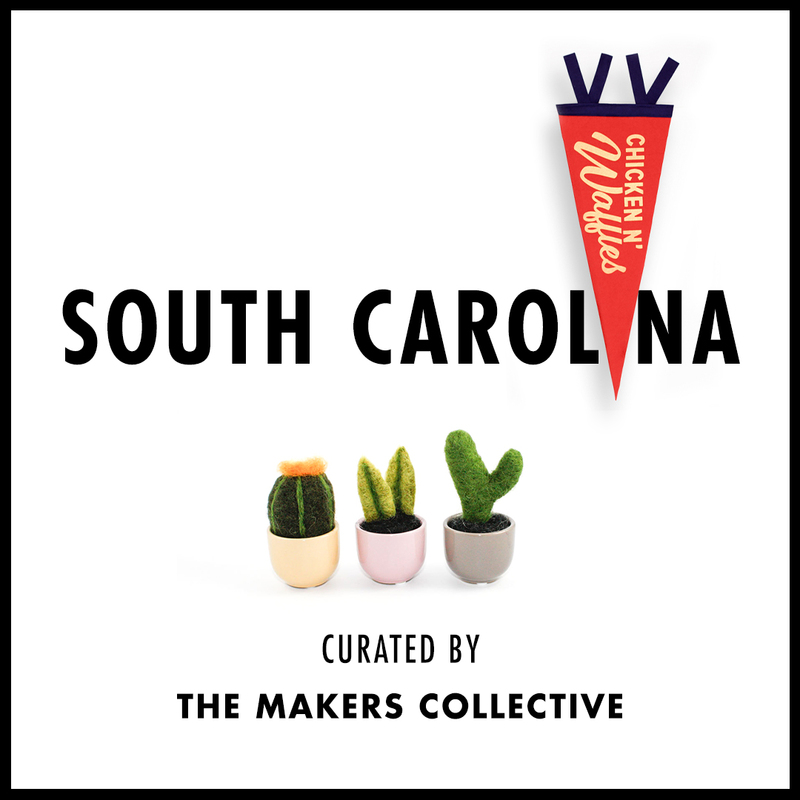 From dapper bowties to a pendant that lets you declare your love for—what else?—chicken and waffles, here are ten things crafted with love in South Carolina. "If you are what you eat, we want to be Chicken n' Waffles." "Ethereal landscapes that will soothe your soul." "Hand-dyed silk scarves add the perfect pop of cheery color." "Monochromatic attire for thoughtfully stylish little ones. Adults, you're in luck, there's some in your size too." "Finally, a plant you can't kill! These needle-felted cactuses will be your non-prickly friend forever ." "Heirloom quality leather goods, made by hand from materials sourced in the USA. Built to work hard and last for generations." "Bow ties and other bespoke accessories for the well-dressed southern gentleman." "Jewelry that exudes simple elegance, handcrafted from precious metals." "Small batch apothecary goods created from ethically sourced, raw natural materials. Perfumed by hand with ancient techniques for the purest and cleanest scent imaginable." "Delightful toys and accessories made from recycled wool and cashmere."